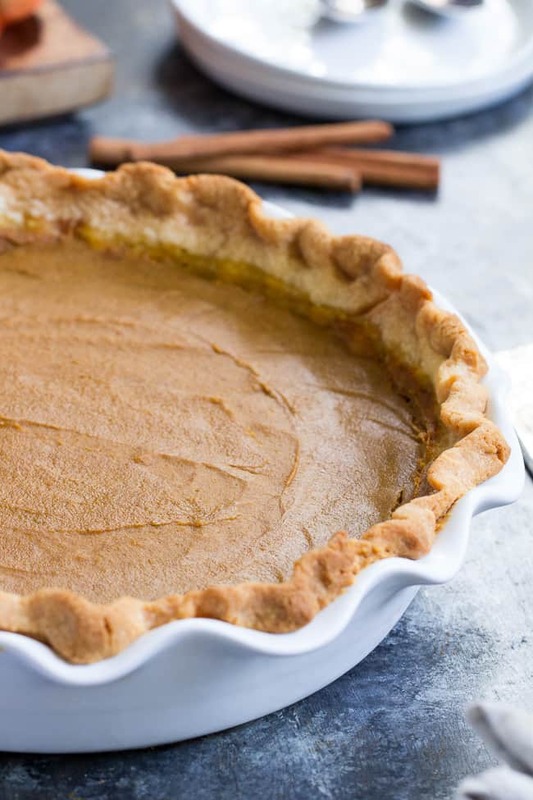 This classic Paleo Pumpkin Pie is just as delicious as any traditional pie you’ve made! 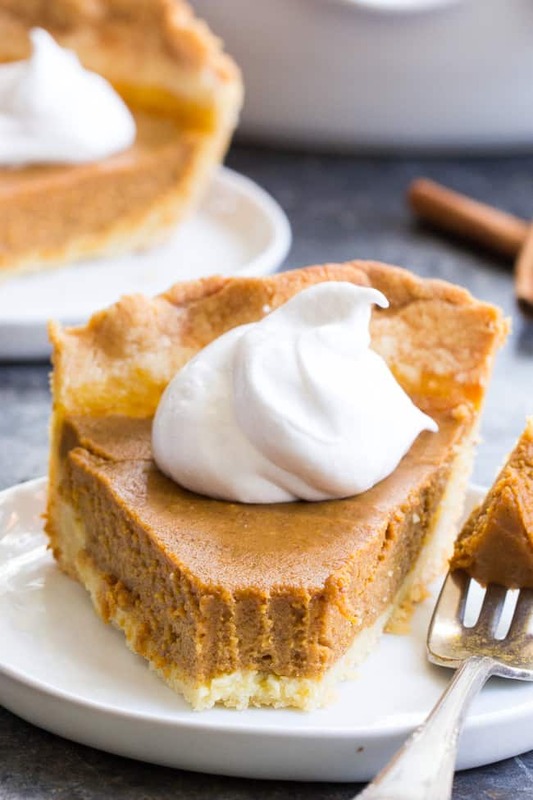 A buttery, flaky paleo pie crust is filled with creamy dairy free pumpkin custard and baked to perfection for a delectable holiday dessert. Great with coconut whipped cream, gluten free, grain free, family approved! 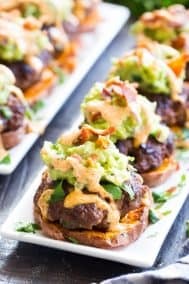 I’m not sure I really have “themed” weeks where all three recipes posted are somehow related to each other, but this week I just can’t help myself – the theme of the week? Paleo versions of classically delicious holiday desserts! Okay, in truth, I’ll be posting more than just 3 holiday dessert recipes before the New Year hits (I mean obviously!) but, I worked really hard on perfecting these few over the past couple of weeks, and, I just HAVE to share them back to back. And, by “perfecting”, I’m talking about testing, which, in the case of this paleo pumpkin pie, meant I made 4 pumpkin pies in one week. All before September 1st rolled around, if you can imagine. So, yes, I’m really feeling the need to share already! You might be wondering why this pie needed 4 rounds before getting the thumbs up. Especially when I actually already have an old pumpkin pie recipe on the site! The first answer to that is, my standards for paleo baking have changed over the past 3 years or so. At first, if I could make something that sort of tasted like the original, that was good enough for me. But now? 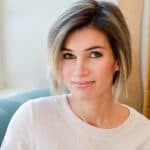 I’m a paleo baking perfectionist, because I’ve personally witnessed how true to the original versions paleo desserts can be. It’s pretty amazing how you can use real-food ingredients and still come out with a finished product that no one can guess are grain free, dairy free, and refined sugar free. 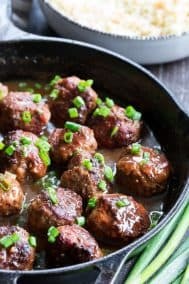 So, standards raised, I test everything until I come up with something I know you (and your families, including the non-paleo members) will love. Step 1 – the crust. This is where I diverted far away from my original paleo pumpkin pie. I used a recipe nearly identical to my easy pie crust, except I added maple sugar, plus used a combination of 2 types of fat – palm oil shortening and grass-fed butter. For the best results, I recommend using a combination of both, or all butter, or all palm shortening. I sadly did not have success using coconut oil for the crust recipe. 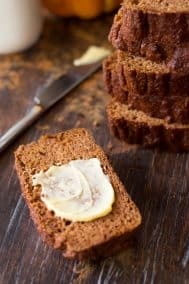 Trust me, I try to use coconut oil whenever I possibly can, and it just doesn’t make for a great crust – greasy while baking and crumbly – 2 thing you probably want to avoid when serving guests. If you can’t have dairy at all, using all palm oil shortening is a great option. Second, we have the filling! Now, I didn’t change the filling much from my original version, but did tweak it to work better with my crust and make for a tastier, creamier, pumpkin spice-ier (?) filling. It’s a mixture of organic pumpkin puree, pure maple syrup, a good dose of pure vanilla extract, thick creamy full fat coconut milk, 2 eggs, and an egg yolk, plus lots of pumpkin spice and cinnamon. Make sure your eggs are at room temperature for this one to get a nice creamy custard after baking – one other mistake I made that cost me one of the pies – eek! Once you have the crust pressed into your pie dish and partially baked (this helps avoid a soggy bottom crust) you’re almost there! Just pour in the filling, bake, and cool completely at room temperature. The “room temperature” part is key – if your pie cools too fast, the filling can crack excessively. Keep in mind that even if your pie filling cracks (a couple are totally normal), the taste isn’t affected at all, and, you always have pretty dollops of coconut whipped cream to cover them up! I hope you guys are excited about the upcoming holidays with this delicious paleo pumpkin pie! Stay tuned for an equally festive apple dessert, and yet another pumpkin one this weekend. Enjoy! 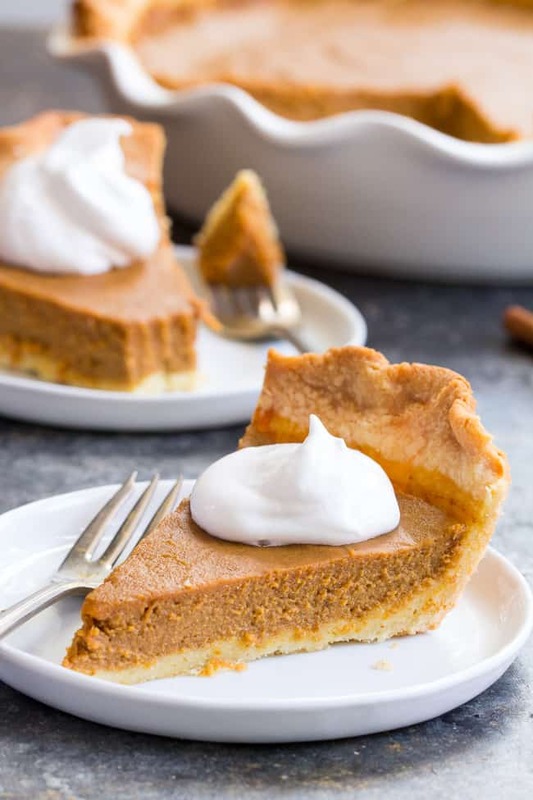 This classic Paleo Pumpkin Pie is just as delicious as any traditional pie you've made! 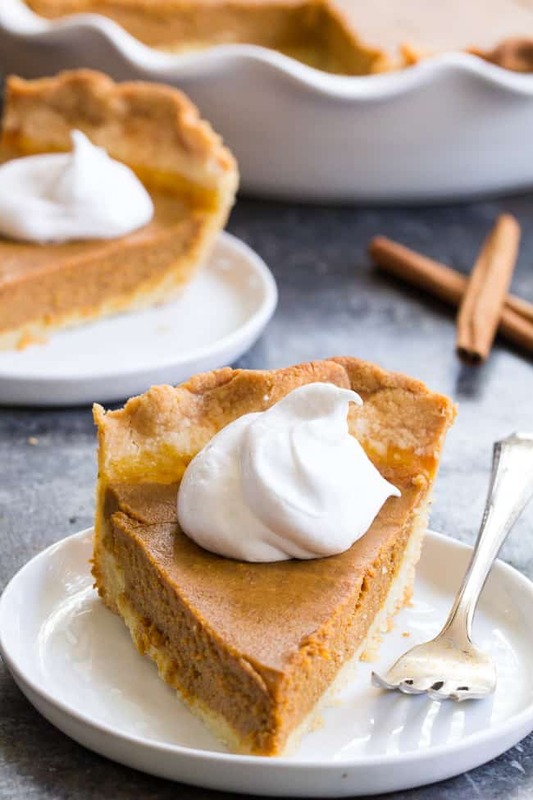 A buttery, flaky paleo pie crust is filled with creamy dairy free pumpkin custard and baked to perfection for a delectable holiday dessert. Great with coconut whipped cream, gluten free, grain free, family approved! Preheat your oven to 375 degrees F. In the bowl of a food processor, pulse all crust ingredients EXCEPT egg to create thick crumbs, then pulse/process in the egg until a dough forms. Gather the dough into a ball, wrap in plastic, and chill in the refrigerator at least 20 minutes prior to rolling or pressing into your pie dish. Bake pie crust in 9” pie dish in the 375 degree oven for 10 minutes until bottom is set, remove from oven and allow to cool for 5 minutes before pouring in filling. Pour filling into partially baked crust, spreading it all around to seal edges. Cover crust with aluminum foil and bake (at 375 degrees F) for 55-65 minutes or until center is nearly set (still a bit jiggly) and crust is deep golden brown. Allow to cool completely at room temperature to avoid excessive cracking of the filling. 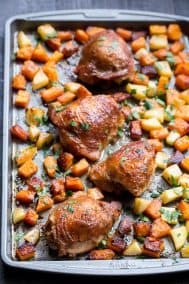 Once cooled, serve, or, cover and store in the refrigerator for up to 2 days prior to serving. Serve topped with coconut whipped cream if desired. Enjoy! 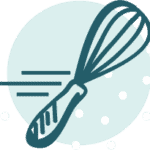 Want More Paleo Holiday Baking Recipes? Try of of these! Do you have pie crust skills? Have you ever been driven totally nuts by pie dough? You must have read my mind I was just talking to my husband about pumpkin pie! I usually make them every year ! I told him humm going to have to find a good recipe because the one I make is made with sweet condensed milk! This is a pumpkin pie I will feel good serving to my family. Thanks! This is perfect, I have been looking for some dessert inspiration and this is exactly what I am going to make now for a dinner party I am going to on the weekend. It was requested pumpkin pie. You are amazing. Thank you so much for sharing this recipe! 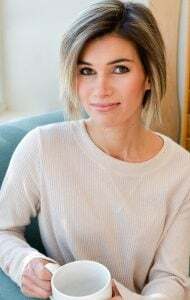 You make some of the best Paleo recipes that I have seen I am so grateful! I’ve been dreaming about making this pie ever since it showed up on my Instagram feed and I bookmarked it to try later. I finally made it and I have to say this recipes deserves all of the stars!! My husband kept going on about how amazing the crust was, and I completely agree. I chose to use half shortening + half grass fed butter and pressed it into my pie dish vs rolling it out. It was so easy! Nobody would ever suspect this pie was paleo 😉 Thank you for such a wonderful recipe! This is going to be my go to pumpkin pie from now on. Honestly the best pie I think I’ve ever made. Definitely the BEST pie crust since we’ve been eating gluten free that I’ve had. Thank you so much! My daughter with celiac ate some and she has never liked pumpkin pie before. So thrilled to hear that! When the kiddos approve, you know it’s the real deal, lol! Hi. Is it important that canned pumpkin puree be used? Or can I make my own. Where I come from, pumpkin puree does not exist. 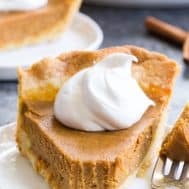 I’ve always been curious about pumpkin in a dessert form as its very uncommon in my country and as a result I’ve never eaten pumkiny desserts. Have a really good feeling about this recipe. Hi! Do you think I could freeze this pie and it would still be good for Thanksgiving? I’ve got some fresh pumpkin purée I made and want to use that up! Thanks! I’m not sure since I haven’t frozen a whole pie. I did freeze the leftover slices but we ate them within about a week, they were fine this way. Is there any other brand of shortening to use? I’ve never seen that one and only have seen nutiva. Hello! Will the crust work if i use a different brand of shortening? Like nutiva? I wondered if you dont prefer it since it is a mix of coconut and palm oil….? One more , if I don’t have a large food processor, can I use my vitamix to make th crust? Thank you for sharing, this recipe sounds amazing. What can I substitute for tapioca flour? Arrowroot typically works the same way, so I’d say that’s your best bet. Thank you, I just made it using arrow root. However, I felt like the crust was missing something, maybe the tapioca flour. Question did you use maple sugar or coconut sugar for the crust? Also made the whipping cream and it didn’t hold its consistency it was very watery. But overall it was very tasty and my family really enjoyed it. 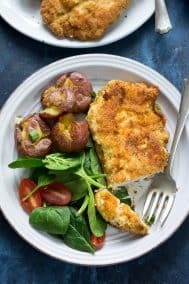 How would this filling work with a nut crust? I’m visiting my in-laws and they don’t have a rolling pin. Actually I will try this crust & push it in. Thanks! I made this pie yesterday and half of it is gone already…I imagine the other half will be gone by the end of the day today. Every element of this recipe is amazing. I had some trouble with the crust because I tried rolling it out in between parchment, but it just stuck to the parchment. That being said, I am making it again this week for Thanksgiving so I will just press it out into the pie pan this time. The crust is so delicious and it holds up really well. I ate the pie like pizza, no need for a plate! The filling was just sweet enough without being too sweet, and you could really taste the pumpkin. I think I will make this year round now that I know it exists. Plus now I have a solid crust recipe for other pies! Thank you for being amazing and creating this recipe. I followed the directions about covering the top before putting into the oven and after 45 minutes the inside was still totally uncooked. I uncovered and after 15 more minutes, still really wet. Trying another 15 minutes, hoping that gets it there. It looks amazing from the recipe and the maple syrup gave it an interesting flavor from what I tasted in the raw filling. I’m having the same problem right now. I’m wondering if only the crust was supposed to be covered with foil? I’ve never covered a whole pie w foil before. After cooking covered for 45 mins, the pie has now been uncovered(the crust is covered) & it’s been cooking 15 more minutes & nowhere near done. I had to cook the pie for an extra 30 minutes as well. I am very curious if we were supposed to cover it with foil. When I baked mine this Thanksgiving it took 15 minutes longer than stated in the original recipe and I only covered the crust. I updated the recipe to reflect my experience and the comments related to baking time! So, it did cook after about 45 minutes extra. Next time I will not cover with foil, and perhaps my pie plate was smaller so the filling deeper. I loved it even tho my crust was overcooked. Looking forward to trying again. Apologies for the extended cooking time! Baking is tricky sometimes with so many variables! Happy at least it worked out somewhat! Same problem here! After 42 min (my oven runs hot) the outer edge just barely looked like it had started to set. Put back in for another 15 min, then another 10 min, then 5 more min, and finally 5 more. So 35 min additional baking time! I kept covered with foil though so my crust did not burn. I had that problem, but in my case, it was because I accidentally bought “pumpkin pie mix” rather than just pumpkin. After an 11pm grocery store run, I repeated the recipe with straight pumpkin and it baked completely in 45 minutes. When I baked mine for Thanksgiving it require more time than my original times listed, about 15 minutes longer. Oven temps/climate and other factors can affect the overall time. Made this for Thanksgiving today and it was amazing. You can’t even tell this crust is paleo. I noticed some others had trouble with the baking time. It also took mine a little longer but it did end up solidifying. Maybe an extra 15 minutes or so. I covered the whole top with foil. Took it out when a butter knife inserted came out clean. I actually noticed the same thing when I baked mine for Thanksgiving, so I’ll be adjusting the baking time! I think for me, things seem to vary by the season/climate. Glad you enjoyed this! The pumpkin custard is a bit heavy on the spices! I should have questioned the amount of spices. I made a “regular” pumkpin pie last week and it called for of the half the spices called for in this recipe. But the coconut cream helped mellow it out. Just finished eating this pie and I have to say it was AMAZING! Whole family loved it too! I only had a small 9inch pie tin so I ended up making two. The pumpkin filling was delicious and wonderfully spicy. I only covered the crust edge with foil and it was done after 45 mins. 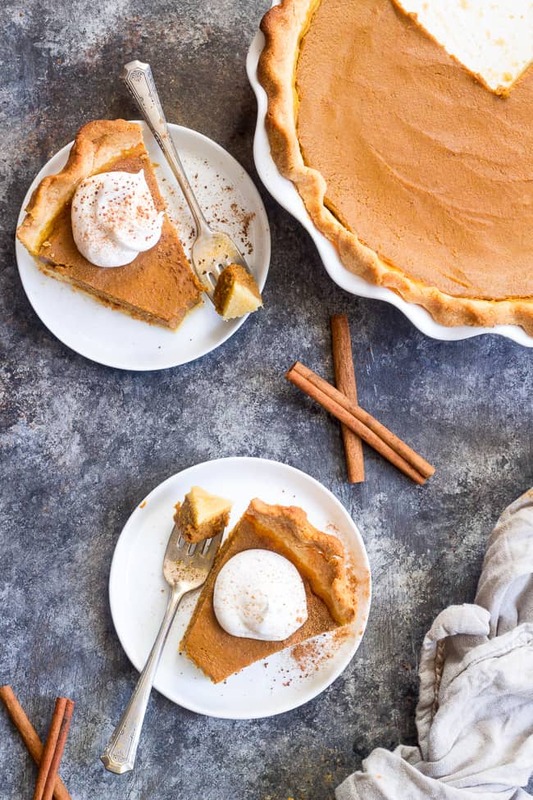 Thank you for this, it is our new favorite pumpkin pie! 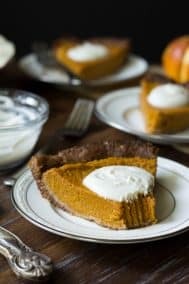 Not this recipe but ive made other pumpkin pies without the crust in a glass pie pan and it worked great! Can I use fresh pumpkin purée instead of canned? This was the best paleo crust I’ve ever made! Thanks for the delicious recipe! This was incredible! I will forever use this in rotation. As always, your recipies are amazing. Is palm oil shortening essential for the recipe? Do you think I could substitute the eggs for ground flax seed (plus water)? It seems to work well in other recipes but I’m not sure how to convert the egg yolk part. I’m not sure how that would affect the filling texture, it might be worth a shot though! Think coconut oil would work instead of butter for the crust? Unfortunately no, not for this one. It comes out way too crumbly. For dairy-free, palm oil shortening is the way to go, ghee might work as well at least for part of the fat. Hi! I’m having such a hard time finding tapioca flour… do you think I can substitute it with arrowroot flour? wonderful- no one knew it was a “healthy” pie!! 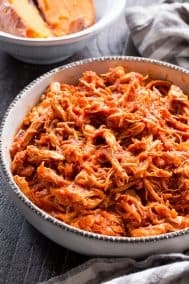 Very easy and absolutely delicious! Thank you! Very good recipe. My daughter and I enjoyed it. I used maple syrup in the crust and it worked just fine. Could the crust be made the day before? Great! Came out perfect! Thank’s!